One of my good friends from high-school is named Kristen. We became friends when we were in the spring musical together our junior year and ended up going to prom together, along with my friend Rachel. 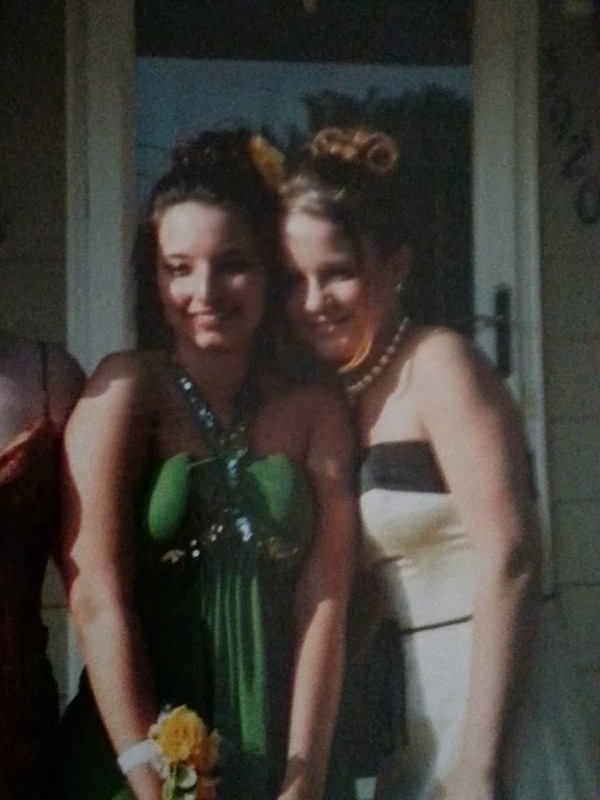 This photo was taken of Kristen and I before prom - she was 17 and I was 16 (so 8 years ago this spring). Kristen's mom took a photo of the photo and shared it on Facebook. Out of all the days, months, and years to have a baby, Kristen and I both had our babies on the exact same day - March 16, 2010! We were out of touch for a few years, so when I first heard this, I could not believe it. Kristen had a little boy, whose name also starts with an "L." If he had been a girl, I'm sure it would be harder for me to see photos of him growing up. It is odd though still to see photos and to know Lily would be the exact same age that he is. Maybe one day I will meet him. I'm sure if I do, thoughts of my girl will flood my heart and mind. What a different day we had on March 16, 2010. The day could have been the day we both welcomed our healthy, full-term babies into the world. Yet, her day was as one would expect a birthday to be: full of joy and celebration, leading to a baby going home from the hospital to friends and family, eagerly waiting to meet him for the first time. And my day was filled with the most profound joy tinged with the deepest sorrow, leading to an empty car-seat on that hospital trip home and family and friends who said hello and goodbye in one breath, if they got to meet my baby girl at all before she was put to rest forever beneath the Virginia earth. For both of us, March 16, 2010 will always hold the memory of giving birth to our first-born babies, oh but what different memories we hold. How different each March 16 is for both of us from now on. The day could have been the day we'd celebrate each year with a cake and candles to be blown out by a child bigger than the year before. But, I celebrate with a cake for a little girl who will always stay a baby and will never blow out her own birthday candles. Not only did Kristen and I have our babies on the same day, but we also had our baby showers on the exact same day - February 13, 2010! Looking at that photo of us in high-school, I can't help but think about how we had no idea we would both have babies on the exact same day. I can't help but think of how carefree I was and how I never could have dreamed I'd one day (less than four years later) lose my baby before she took her first breath. Of course I would never, ever wish for anyone to know the pain of losing a child, but I can't help but wonder, why did it happen to me? I know deep down that God was in control and He has graciously allowed me to see some of the reasons. But I am a mere human, a mother, who has part of her heart in Heaven and will in a way always wonder why it had to happen to me. (((hugs))) I too mark the milestones of what my children would be doing based on my friends children.... it is sometimes almost too much to bear. I'll never forget one picture that we took with our homeschool group one year. Everyone had babies in arms and mine was dead... fortunately one of my very dear friends had two arm babies and needed an extra pair to hold one. The one I got to hold was one that matched the age one of mine would have been..... I'm nearly crying in the photo! Fortunately it was a huge group shot and you wouldn't know it if you didn't know it! And now I'm going through the loss of a child. Maybe we were meant to know each other.